Comment by Julio Severo: I didn’t like the mocking tone that the leftist American newspaper used to speak about Malafaia, but the leftist mindset is narrow and it keeps them from seeing reality as it is. The newspaper erroneously compares Malafaia to Pat Robertson, a conservative in times gone by so solid that he even suggested that Hugo Chavez, a friend of Lula and Dilma Rousseff, should be murdered. Although Malafaia has, on the abortion and gay agenda, the same stance as real conservatives do, his political leanings keep him away from a legitimate conservatism, and such fact was recognized in the interview itself when he admitted to have voted for Lula twice and not to have anything personally against Rousseff. If she didn’t support abortion and homosexuality, would everything be ok? Of course not. See, she was formerly a terrorist, and she has never repented of her terrorist past or of her socialist ideology and her connections with Hugo Chavez and Fidel Castro. That repugnant socialist aspect doesn’t seem to be an inconvenience to Malafaia. I will continue, as a writer and blogger, to support Malafaia as he attacks the radical abortion and homosexual agenda. But how can we Brazilians follow his disastrous political leanings? It is a pity that he doesn’t have 50% of Michele Bachmann’s political convictions. SILAS MALAFAIA’s books, which sell in the millions in Brazil, have titles like “How to Defeat Satan’s Strategies” and “Lessons of a Winner.” The Gulfstream private jet in which he flies has “Favor of God,” in English, inscribed on its body. As a television evangelist, Mr. Malafaia reaches viewers in dozens of countries, including the United States, where Daystar and Trinity Broadcasting Network broadcast his overdubbed sermons. Over 30 years, Mr. Malafaia, 53, has assembled thriving churches and enterprises around his Pentecostal preaching. Still, he might have garnered little attention beyond his own followers had he not waded into Brazil’s version of the culture wars. After all, Brazil has evangelical leaders who command larger empires, like Edir Macedo, whose Universal Church of the Kingdom of God controls Rede Record, one of Brazil’s biggest television networks. Others, like Romildo Ribeiro Soares, of the International Church of God’s Grace, are known for greater missionary zeal. But it is Mr. Malafaia who has recently attracted the most attention, with his pointed verbal attacks on a broad array of foes, including the leaders of Brazil’s movement for gay rights, proponents of abortion rights and supporters of marijuana decriminalization. Silas Malafaia gives an interview at the backyard of a hotel prior to an event. “I’m the public enemy No. 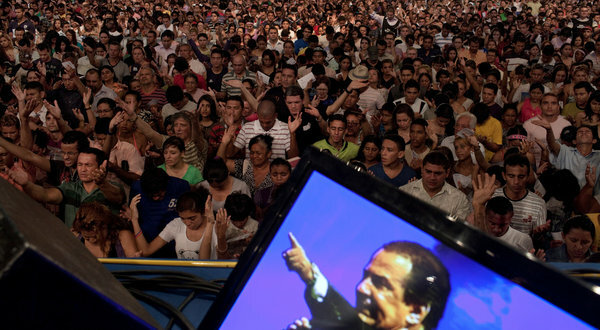 1 of the gay movement in Brazil,” Mr. Malafaia said in an interview this month here in Fortaleza, a city in Brazil’s northeast where he came to lead one of his self-described “crusades,” an event mixing scripture and song in front of about 200,000 people. Tears flowed down the faces of some of the impassioned attendees, while others danced to the performances that served as his opening act. Before ascending to the pulpit, he described how coveted he had become on television talk shows as a sparring partner with gay leaders. But that is only a small part of his repertoire, and television is just one of many media at Mr. Malafaia’s disposal. On Twitter, he has nearly a quarter of a million followers, and in videos distributed on YouTube, he lambastes not only liberal foes but also journalists and rival evangelical leaders. Not surprisingly, his rising prominence has made him the source of both admiration and unease. He mobilized thousands to march in the capital, Brasília, this year against a bill aimed at expanding anti-discrimination legislation to include sexual orientation. “He’s like Pat Robertson in the sense of being a pioneer in moving Brazil’s evangelical right into the national political realm,” said Andrew Chesnut, an expert on Latin American religions at Virginia Commonwealth University, comparing Mr. Malafaia to the conservative American television evangelist. Brazil’s elite is seeking to understand the rise of such a polarizing figure, and how it might influence the nation’s politics. Piauí, a magazine that is the rough equivalent of The New Yorker in the United States, ran a lengthy article this year on Mr. Malafaia’s rise from obscurity in Rio de Janeiro, where he grew up in a military family, to the power he now wields. BEYOND Mr. Malafaia, the broad expansion of evangelical faiths, particularly Pentecostalism, in recent decades is altering Brazil’s politics. (While Pentecostalism varies widely, its tenets in Brazil include faith healing, prophecy and exorcism.) Leaders in Brasília must now consult on a range of matters with an evangelical caucus of legislators with resilient clout. About one in four Brazilians are now thought to belong to evangelical Protestant congregations, and Pentecostals like Mr. Malafaia are at the forefront of this growth. In a remarkable religious transformation, scholars say that while Brazil still has the largest number of Roman Catholics in the world, it now also rivals the United States in having one of the largest Pentecostal populations. Not everyone in Brazil is enthusiastic about this shift. In a November essay, the journalist Eliane Brum wrote of the intolerance shown toward atheists in Brazil by some adherents of born-again faiths, describing what she called the “ever more aggressive dispute for market share” among big churches. Ms. Brum’s essay unleashed a wave of reactions from Pentecostals. Mr. Malafaia’s words were among the most caustic. Whether by design or default, his aggressive language has often become a spectacle. In November, Época magazine reported that Mr. Malafaia, during heated comments about taking legal action against Toni Reis, a prominent gay-rights advocate, said he would “fornicate” Mr. Reis. The visibility Mr. Malafaia achieves from such episodes has fueled questions about his political ambitions. He said he had no desire to run for office because it could make him beholden to a specific political party, thus curbing the broader visibility he now has. But political influence is another matter. Mr. Malafaia said he voted twice for Brazil’s former president, Luiz Inácio Lula da Silva, and for years enjoyed access to Brasília’s corridors of power. But he also related an anecdote about Mr. da Silva’s successor, President Dilma Rousseff, that suggests how important evangelical figures are becoming in national elections. He said she spoke with him by telephone for 15 minutes during last year’s presidential campaign, trying to lure his support. But he said he refused because of ideological differences with parts of the governing Workers Party of Mr. da Silva, a former labor leader, and Ms. Rousseff, a former operative in an urban guerrilla group. MR. MALAFAIA, while stabbing the air with fingers adorned with diamond-encrusted gold rings, delivers such tales in booming Portuguese with a thick Rio accent. His persona has given him almost rock-star status among some supporters. “I didn’t recognize him without his mustache,” said Erineide Mendonça, 39, an employee at the Fortaleza hotel where Mr. Malafaia was staying, referring to the trademark facial hair that he shaved not long ago. “But I recognized his voice,” she said, asking to be photographed with the evangelist she adores. Both Mr. Malafaia and his wife, Elizete, were trained as psychologists, and when he rises to the pulpit, his voice echoes in sermons laden with lessons of self-help and perseverance. A favorite theme involves success and how to attain it. While he contends that he still lives relatively humbly and is not even a millionaire, he makes no apologies for his own material rise. In fact, he celebrates it, touting, for instance, his Mercedes-Benz — a gift, he explains, from a prosperous friend. Then there is the Gulfstream, acquired secondhand in the United States, he said, not by him but by his nonprofit religious organization at a reasonable price.